To remember a native village or town, to collect written accounts, and photos and maps, of Armenian life there, to raise funds among Armenians with ties to that village, to publish a book that displayed all of this material. This was the decades-long dream of many who made up the first generation of Armenian exiles. It was in this general environment, starting in the 1920’s, that books began to appear in succession in various Armenian diasporan communities by authors attempting to revitalize the Armenian past of their native community. Here, the written word had become a medium towards reconstructing the past, of times irretrievably lost. These authors, it seems, were convinced that they were the last survivors of the Armenian-Ottoman period. And they were certain that coming generations would be unable to reconstruct that past in a genuinely comprehensive manner. Thus, they felt the need to immortalize this legacy of the past, this town or village of another time, by putting pen to paper and writing eyewitness testimonies. We often encounter the terms “Houshamadyan” (Book of Memories), “Hushakotogh” or “Hushartzan” (Memorial, Monument) in the titles or prefaces of these books. This is where the general term “houshamadyan” describing them comes from. In this way, the publication of a book is transformed into a ceremony marking the installation of a stone memorial—in this case, in memory of a deceased town or of a time irretrievably lost. But this memory-book is also tasked with preserving the life of the past, the memory of a lost town, with its history and traditions, heroes and glory, architecture, cuisine, song, and dance. In other words, the publication of a houshamadyan inevitably becomes what Marianne Hirsch has termed a post-memory,  a legacy granted to coming generations. These books number in the hundreds, and are often similar in their internal composition, style, and content. Naturally, some are professional in nature, authored by the Armenian intellectuals of the day; others were written by individuals with few literary skills, who merely desired to leave an account of their native community. It would not be fair to classify these books based on some sort of qualitative internal ranking system; for, each of them represents a micro-history of a region, town, or village in the Ottoman Empire and is a rich source of—generally complementary—information. The scattered information contained in these books is similar to the multi-colored pieces of a mosaic—only by placing the pieces next to each other can one hope to recreate even a rudimentary image of Ottoman-Armenians and their daily life, an image estranged from today’s world. Plain of Harput/Kharpert with its Armenian towns and villages. The Aradzani River (Eastern Euphrates, Murat River) appears as it flows today, after a number of dams altered its original course. Map prepared by George Aghjayan and reworked by Houshamadyan.
. Rev. Harutyun Sargisian (Alevor)’s Բալու. իր սովորոյթները, կրթական ու իմացական վիճակը եւ բարբառը [Palu. Ir sovoruytnere, krtakan ou imatsakan vichake yev barbare] [Palu: Its customs, educational and intellectual state, and dialect] (Cairo, 1932).
. Manoog B. Dzeron’s Բարջանճ գիւղ. համայնապատում (1600-1937) [Partchanj gyughe. Hamaynapatum (1600-1937)] [Parchanj village. Encyclopedia (1600-1937)] (Boston, 1938). The two authors were largely successful in re-creating the Armenian village with its various facets of daily life. When these two books were published, the rural and urban life of Ottoman-Armenian communities were still familiar to an entire émigré generation born and raised in the empire. The traditions, customs, cuisine, and songs described in these books lived on, to varying degrees, in the Armenian emigrant communities of the diaspora. The works of Manoog Dzeron (Manuk Tzeron) and Alevor can thus be regarded as genuine portrayals of a village lifestyle that was already familiar to many, and that for some continued to be a part of their daily lives. Alevor expressed this goal -the “obligation to collect, assemble, and immortalize the relics of a dying people”  -in the preface of his book. 2) Manoog B. Dzeron, Բարջանճ գիւղ. համայնապատում (1600-1937) [Partchanj gyughe. Hamaynapatum (1600-1937)] [Parchanj village. Encyclopedia (1600-1937)] (Boston, 1938). The ones “dying,” in this case, were members of his own generation, and the obligation to inscribe a collective memory, a type of dedication to “the memory of my homeland,” was his. Manoog Dzeron said the same, albeit in a more emotive style, when he likened his book to a faraghat, “the property deed of our noble village which I have written with the ink of my tears for our future generations.”  Yes, what they did was in the true nature of a mission: to transfer their personal (Palu or Parchanj) identity and memory, which also belonged to an entire generation, to their children, their grandchildren, and those yet to come. In the minds of these authors, however, it was not only their generation, but their village, that was dying. After the annual floods, Dzeron writes, it was the Armenians who cleaned and repaired the springs and water pipes. But he’s learned from travelers there that the fountains and holding reservoirs (kehriz) of Parchanj have since already “dried up, the wells have crumbled and clogged, and only two flowing springs and one water well remain in the village.”  While we don’t know how valid such information was, we are certain that the two authors were aware that in Turkey, starting in the 1920’s, a general policy was enacted that aimed at wiping out any physical traces of an Armenian presence. Armenian churches, cemeteries, and schools were to be destroyed in the years to come, and place names were to be Turkified: Parchanj/Perçenç village was to become Akçakiraz, and Palu, the town so memorialized by Alevor, was to be completely razed to the ground; a town bearing the same name was to be built some 2.5 kilometers to the west. The Armenian district of the city of Harput/Kharberd, so familiar to both authors, as it was where they lived and worked, was also completely destroyed. And the various Armenian-populated villages in the area were to be submerged underwater when a dam was built on the Euphrates. Thus, the authors’ goal was to preserve the legacy of a dying generation. They knew that as the years rolled on, traditions would vanish, social perceptions would change, the Armenian language would, in many cases, become estranged, and interest in these things would wane. From this perspective, it’s no mere accident that many of the authors of such memoirs, especially in the United States, set out to have their works translated into English during their lifetime. They knew well that a linguistic barrier would distance coming generations from their words. Of the two books presented here, only that of Manoog Dzeron has been translated into English. It took 47 years for Suren M. Seron, his son, to carry out that promise to his father. Today, when we attempt to resurrect the social landscape and daily life of Ottoman-Armenians through primary sources, the works of Manoog Dzeron and Alevor stand before us as shining beacons, fully illuminating our way forward. In fact, not only does a lost Armenian past spring anew from the pages of their books, but an entire rural heritage is reborn and appreciated: The construction of the village house, the cultivation of the fields, the tools of the peasant toilers, the growing of grapes, wheat, and mulberries, and the food and drink prepared from them, the taxes, schools, the agha and bey, the housework, village games and holidays… Through the richly colored pages of their books, these two authors open up the world of village life, and present the rural social milieu with deeply penetrating details. This prompts us to state that we are dealing with two distinct short tracts that brilliantly shed light on the Armenian village of the Ottoman Empire, on the life and prevalent social conditions that existed there. Through these books, it is possible to closely learn about, study, and understand the villager of Harput or Palu—a figure that has since vanished without a trace. Manoog Dzeron’s grandfather, Dzeron Varpet (master, in Armenian), was a famous carpenter in the village of Parchanj. He was so skilled in his craft that he began to engage in architecture, and was the mastermind behind the construction of the village bathhouse, the Surb Prkitch Church, and various mansions (konak). This Protestant resident of Parchanj had also traveled to Istanbul to help design some major structures. Master Dzeron’s son, Petros Dzeron (the father of Manoog Dzeron), would later perfect this craft and become a prominent craftsman in his own right, mastering carpentry, furniture-making, mechanics, architecture, and geometry. The plan for a two-story building in Parchanj. The house belonged to an Armenian family bearing the surname Khojgants. 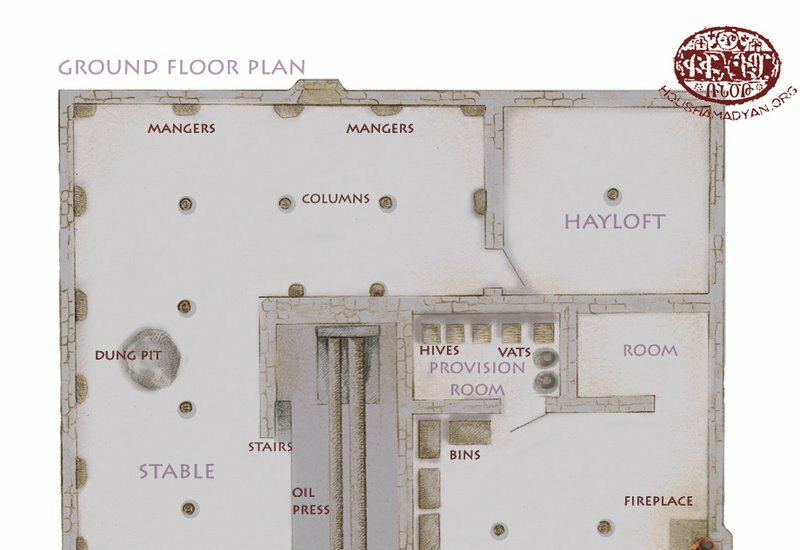 The plan was printed in Manoog Dzeron’s book. It was prepared by the author himself, and then redrawn by his son, Levon Dzeron. The version presented on this page was reworked by Houshamadyan. We have tried to maintain the authenticity of the original, while giving it a visually more appealing look to this amazing document. From Palu to Providence: Survival of a Legacy - A FAMILY GATHERING from Houshamadyan on Vimeo. This short biography shows that we are dealing with an Armenian who was very familiar with the contradictions and extremes of the Ottoman regime, someone who was also a prominent architect who knew his village and its life well. Like Dzeron, Alevor also left his native village quite early on. Yet, his memories of his birthplace did not wane; on the contrary, as the clergyman from Trkhe wrote, “after the tragic collapse of my centuries-old native village, its apparition began to live even stronger in my imagination…”  Prior to his short stay in Cilicia and his later permanent resettlement in Egypt, Alevor spent half his life in a village setting. Trkhe, Sarıkamış, Kesirik, Arghana Maden—these were all villages where Alevor worked as a parish priest and teacher, but also, we believe, as an average villager doing various household and agricultural chores. A sincere reproduction of village life comprises the core of the books written by Manoog Dzeron and Alevor. The two authors tried their best to achieve this. Before appearing in book form, Alevor’s work was published in serial form in the Cairo weekly newspaper Lusardzak from 1927-1928. The series was interrupted when the newspaper closed. In 1930, Alevor had the opportunity to spend a week in Beirut and Damascus, where he culled information from former Palu residents and other compatriots now living there, which he published in a separate work in 1932. Alevor’s book was an exception, in that many books in the houshamadyan genre were a result of collaborative work. It was the compatriotic union of former village residents living in the United Sates that raised the funds and placed the order for Manoog Dzeron’s Parchanj book. While Dzeron’s personal stamp is evident on every page of the book, he nevertheless collected certain information from his compatriots. Manoog Dzeron wrote the book from 1931-1937. At first glance, one finds many similarities in the descriptions given by the two authors. This is to be expected, given that Harput and Palu are located in the same geographical zone, and there aren’t major differences in traditions, dialect, traditional farming methods, dress, house building, home chores, and other aspects of daily life. Thus, a natural closeness is created between these two books and, regarding various themes, they complement one another. The two authors describe village life in a completely natural way, for both are children of the village. In the case of Alevor, it is clear that he also tilled the land and personally used many of the farming and household tools he describes. 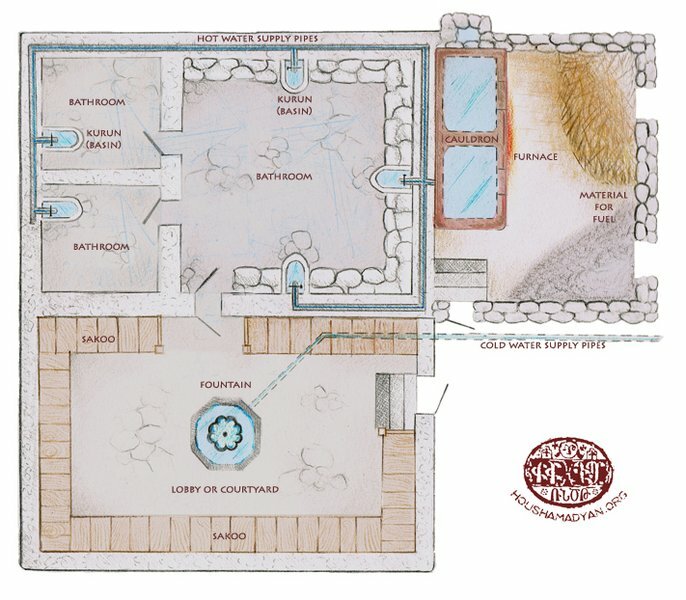 Manoog Dzeron, on the other hand, was a master mechanic and architect, and it is clear that he enjoyed providing descriptions and instructions on the building of village homes and watermills, and the use of engineering equipment. Examples can better show that this was the case. (1) copper tray; (2) cocoon; (3) hearth; (4) bench; (5) cupboard; (6) get-gal; (7) reel; (8) hook; (9) whip; (10) top; (11) main reel; (12) string. One of Alevor’s masterpieces is his description of the cotton-making process, from harvesting the crop to producing yarn. He was very familiar with this cultivation and craft, and his depiction is based on personal experience. The chapter on farming starts with the process of preparing cotton seed for sowing, and then portrays the sowing itself, followed by the kakhank, the work to clear the fields of harmful and unnecessary grasses. The next step is the bampak krtel, where the upper portion of the cotton stalk is slightly cut to allow the plant to grow and produce branches. Then, the cotton enkuyz (unopened cotton bud) blossoms, quickly turning into a khchech (opened bolls). The field work ends with the harvest (kagh) of the buds. The crop is brought home, where it undergoes a number of stages in the handicraft process. For the Armenians of the Palu district and the Harput valley, this was surely a skill passed down through the centuries. The first stage, called tchalkhavu, allowed for the separation of the cotton from the entwined vines, leaves, soil, and dust. The cleaned opened bolls were then separated, one by one, from their dry and sharp husks. Another machine called the chrchr was then used to separate the cotton from the husk. The next step was to card/comb (aghnel) the cotton, softening and cleaning the fibers. This was followed by using a spinning wheel (jayr) and an implement called a nazuk to turn the fibers into a spun yard twisted onto a masura. These implements were then placed on a tastachagh, the henk (warp; in weaving cloth, the warp is the set of lengthwise yarns that are held in tension on a frame or loom) was prepared, and it was then possible to begin the hor (weft; thread or yarn that is drawn through the warp yarns) work, the actual weaving of the cloth. Alevor devoted 24 pages to describing the entire process in painstaking detail, resurrecting this ancient weaving craft, the Palu variation of which no longer exists today. For the average, non-expert reader, all of this might seem somewhat burdensome or tedious. Even experts may not understand certain descriptive segments. We have the impression that Alevor wrote quickly, not reviewing or editing his text. Yet, there is a rich vocabulary regarding weaving and agriculture, in general, to be found in these pages. Many of the words are no longer used today; the meaning of some cannot even be found in the most specialized of dictionaries. Nonetheless, this section by Alevor (indeed, the entire book) is a splendid source for those working to restore the heritage of the Ottoman-Armenian—in this case, the villager and his craft of making cloth from cotton or wool. Alevor and Manoog Dzeron did more than merely restore scenes of a lost and forgotten rural way of life, however. While it is true that their works aren’t literary in nature, they conveyed an enthusiasm (particularly in the case of Manoog Dzeron) to recreate the village milieu, to relive certain moments in time. In these conversations, Manoog Dzeron uses both the real names of Parchanj villagers—Tepo Karo, Kilarji Karamuyi kin Yeghso, Kelen Aruti kin Vardo, Jaghepan Hobbala Tono—and names similar to other, actual village residents, who recite their lines like stage actors in his book. And they all speak in the local dialect. By this time, readers of the book already have a cursory familiarity with these names and families, since the author has devoted the first 67 pages of his book  to the Armenian villagers of Parchanj, their family lineage, and short biographical notes. Manoog Dzeron’s book opens with a topographic map of Parchanj and area villages. Here, he depends on his memory and experience as the architect who once constructed the thoroughfares in those same villages. The map shows the area’s lakes, rivers, mountains, and roads. Two pages on, we find one of the most important elements that make this book unique: the street map of Parchanj village, which he has also drawn. He presents the houses of Armenian and Turkish families (each one bearing the owner’s name), the gardens, fields, churches, schools, mosques, and cemeteries. 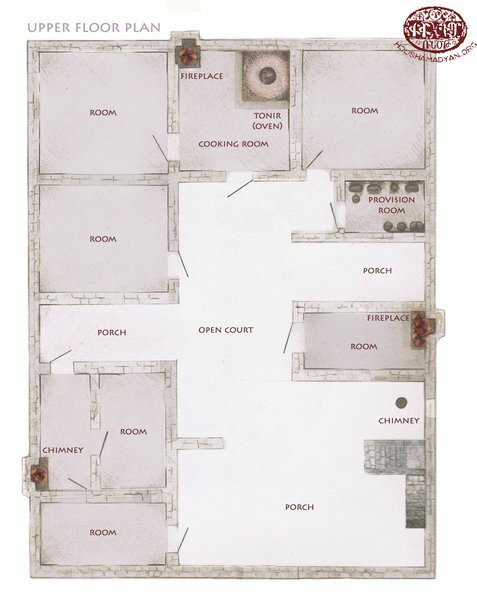 The map and street plan aren’t the only sketches in Dzeron’s book. The work stands out with its numerous drawings, and it is evident that he has understood the importance of visual representations as a method of memory restoration. In this, Dzeron was assisted by his daughter Nvard Goshgarian (Koshkarian) and son Levon Dzeron, who reworked some of their father’s sketches. 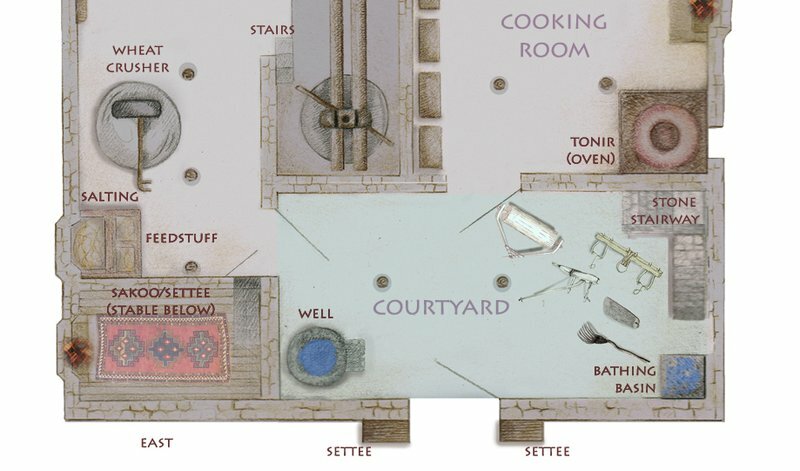 Alevor also used sketches, mostly to depict domestic, engineering, and crafts tools, plants, and household items. We believe that his son, Paruyr Sargisian, helped with the sketches;  Yet, they lack the precision and clarity of Manoog Dzeron’s images (for, the author of the Parchanj book was an architect by profession, and his daughter, a painter). In any case, both authors, with their use of sketches as an art form to restore the routine of bygone days, hold a unique place among the hundreds of other authors of houshamadyans who, both prior and after our two authors, either didn’t appreciate the importance of the “sketch/remember” concept, or didn’t have the means to put it into practice. Instead, there are photographs. In almost all such memoir journals, photographs were used to varying degrees to show panoramas of towns and villages, the local church, school, a family or an individual. However, an author tasked with writing the history of his town doesn’t always enjoy the luxury of having a rich photo collection at his/her fingertips. In this respect, the books written about Parchanj and Palu are expressive. Manoog Dzeron was able to collect family and individual photos from compatriots. Parchanj, in fact, was one of the villages where the migration of menfolk to the United States had already reached its peak by the end of the 19th century. The migrants were mostly newly married men who had left their wives and newborn behind to work in the factories of America, and send their wages back to their families. The men constantly dreamt of returning to their native village in a few years. 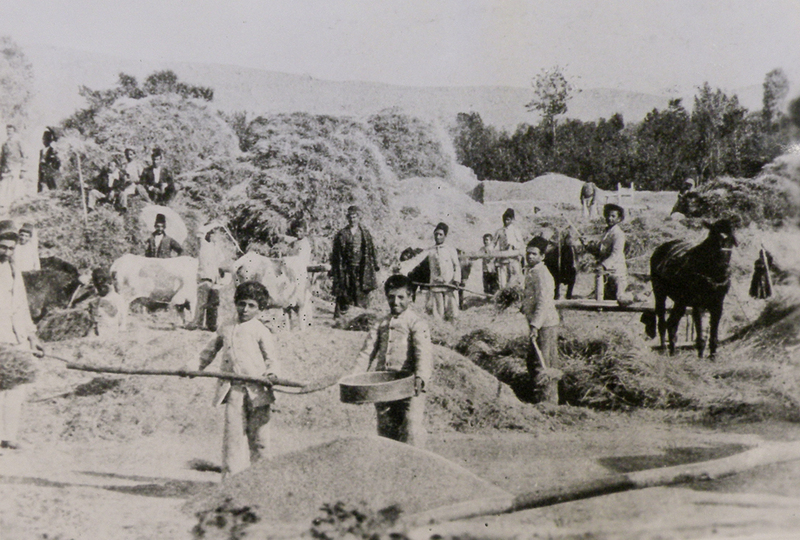 Letters and photos maintained a connection between families, and the art of photography in the Harput valley underwent a period of development in subsequent years. Families would go to the large towns of their area, like Harput or Mezire, to have their photos taken, and would then send the prints to their relatives in America. Oftentimes, photographers would make their rounds of the villages to ply their trade. Many Parchanj residents left, never to return, thus escaping the massacres of 1915. Their family photos often served as their only remaining relic of their native village. 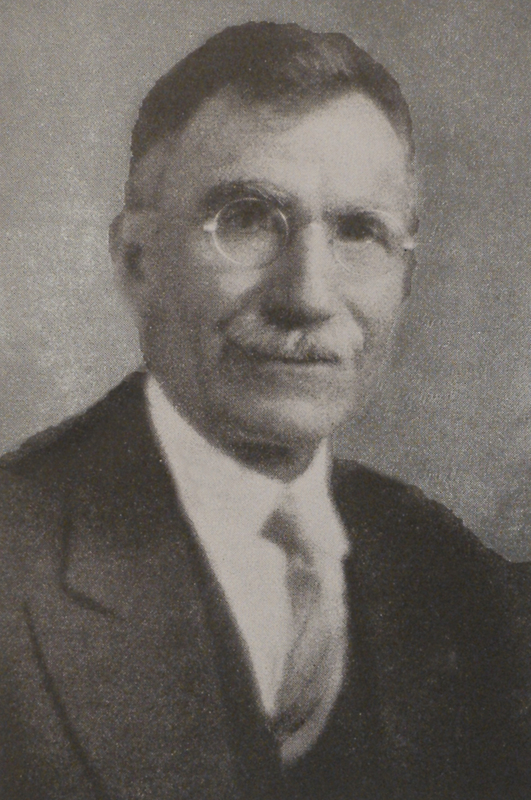 In his mission to collect such photos, Manoog Dzeron was assisted by the Parchanj Compatriotic Union, which played a coordinating role between the author and former Parchanj residents scattered across the United States. In contrast, Alevor’s journal lacks a rich photographic archive, likely because he didn’t enjoy the assistance of a compatriotic society or an organization that could at least gather photos from former Palu residents living in various immigrant communities, especially in the United States, or cover the costs of publishing a work rich with photos. But running counter to this tendency to wipe out all Armenian traces was a memory, held by the residents of those very same Ottoman places, by Armenians, Turks, Kurds, and others. The Turks and Kurds maintained a prolonged, forced silence regarding their past coexistence with Armenians, a theme which isn’t generally publicly alluded to by those of that generation. If the subject is publicly broached at all, Armenians are portrayed in a negative light. Thus, those Armenians who left their native home, never to return, are both the bearers of that memory and the ones who desired to publicize and pass on that memory. The exiles of this first generation began to produce a multitude of books in the memoir genre, striving to serve as witnesses to their native Armenian heritage, and working to prevent further destruction of a memory. To write, to confirm, was their classic form of expression. But they were the native offspring of the village or town, and the memory linking them to this native world also had a visual and auditory nature, at the same time. The question was how, and by what medium, to transfer such legacies, especially at a time when they had none of today’s technological, multi-media possibilities. 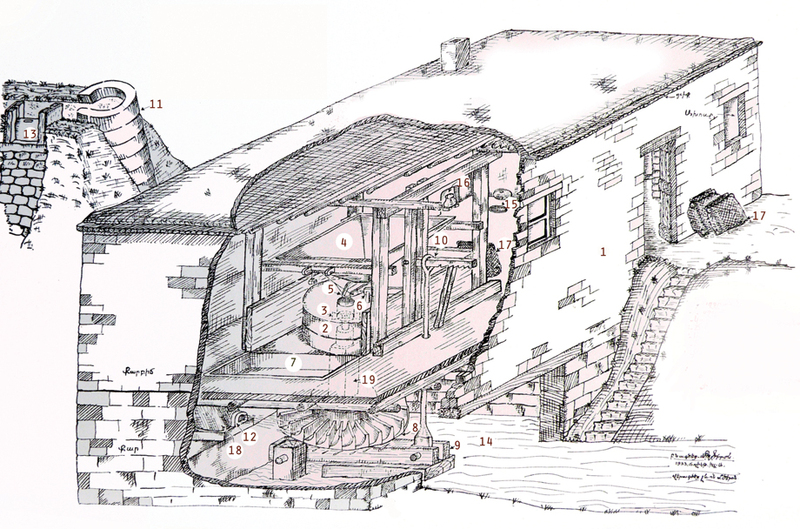 (1) mill; (2) millstone; (3) driver (karmuchak); (4) pail (takna); (5) spout; (6) tchakhtchakh; (7) flour store (alertun); (8) waterwheel; (9) support post; (10) lever; (11) water channel; (12) nozzle; (13) sluice gate; (14) millrace; (15) oven; (16) hearth; (17) aghvon; (18) beehive; (19) wooden post. There are 104 drawings in Manoog Dzeron’s book, which taken together reproduce the agricultural life of Parchanj. This rural daily lifestyle, with many of its traditional aspects, surely continued even after the disappearance of the Armenians. But this lifestyle, in its sweeping scope, has today likely become a legacy of the past. It may have been the consciousness of eternal exile and a desire to preserve the local Armenian legacy that drove Manoog Dzeron to sketch these implements of rural life in complete detail. Certainly, he wouldn’t have done this had he continued to live a normal life in Parchanj or had the Catastrophe, which uprooted every facet of an Armenian existence from this village, not occurred. Thus, the Turks of Parchanj, who were Manoog Dzeron’s contemporaries and continued to live there, most likely used the same tools to plough the land, harvest grapes, or mill wheat, and didn’t use such remember-writing and remember-sketching methods. The pain of loss, longing, and demand for justice were all emotions that Manoog Dzeron experienced when preparing his book. These were the main motivators behind his memory writing and memory-sketching project. Absent such emotions, he most likely would not have initiated such a work, complete with text and drawings, to reconstruct a past life, especially not with such diligence and vigor. There are 116 drawings in the Parchanj book. 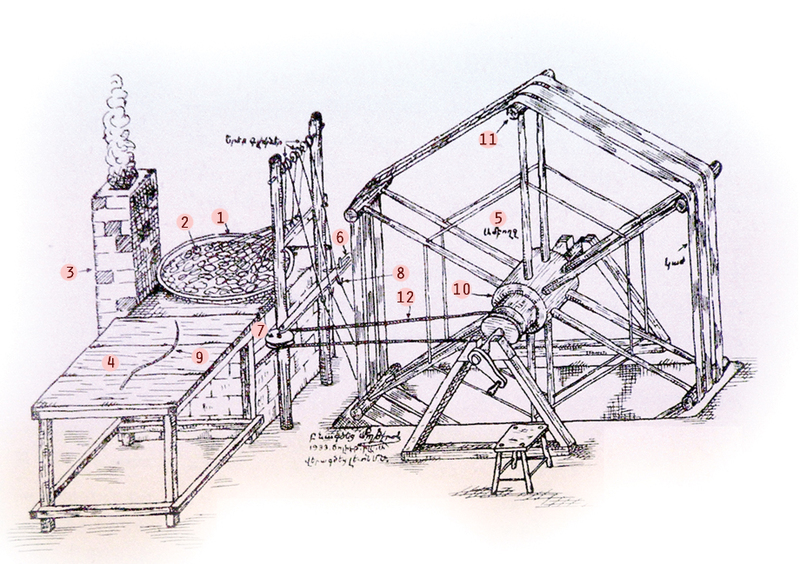 The author has sketcheds a wheel cart with all its component parts, all the tools used for weaving, the flaxseed oil press, the factory making silk from cocoons, the process of combing cotton, and many others. We find 166 drawings in Alevor’s book. Though less than perfect, they nonetheless are very helpful from the perspective of resurrecting a material culture. In this series, for example, is the khorbologh (also, khulinchak or khulunchik), which was hung from the very center of the house ceiling throughout Metz Pahk (Great Lent). 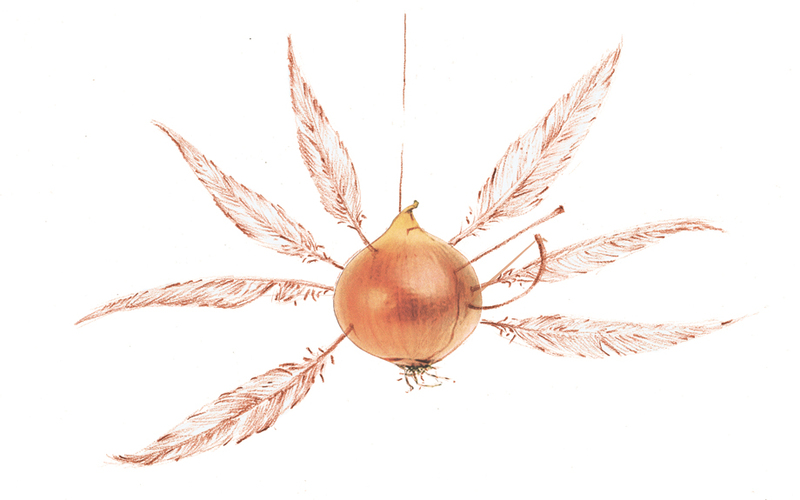 It is was constructed of a firm onion with seven rooster feathers pressed into it, each one representing the seven weeks of Great Lent. This sketch of by Alevor of the Palu khorbologh is unique in the fact that we also see a small spear attached,; a symbol used to frighten any children thinking about violating Lent. Their books of the two authors are replete with dialect words, many of which have fallen out of use or their meaning forgotten with the passage of time. Alevor’s dictionary includes some 3,500 words; and that of Manoog Dzeron’s, 1,700. The books of Manoog Dzeron and Alevor were written with the aim of presenting the village life of Parchanj and Palu, respectively. 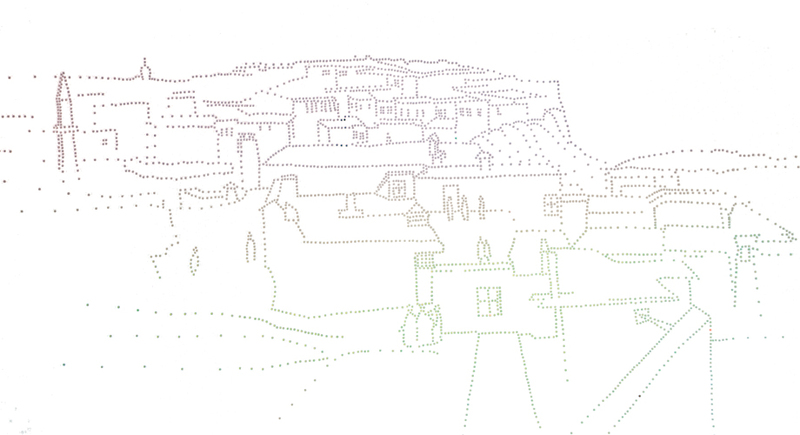 Alevor does not directly focus on his native village of Trkhe; in fact, it is hardly even mentioned in his book. For him, the Armenian-populated village of Palu and Armenian village life comprise one overall subject. For this reason, his descriptions cover all of the regional villages. As for Manoog Dzeron’s book, its general subject is restricted to Parchanj, or more correctly, the Armenians of Parchanj. The exception is the subchapter entitled, “The Turks of Parchanj,” that includes various sections: “Turkish families,” “Memorable village Turks,” “The religious and educational state of Turks,” “The Turkish family: Customs,” “Turkish traditions: Betrothal, wedding, divorce, hac/hadj (pilgrimage),” “Community administrative structure.”  Despite Dzeron’s inclination to paint Turks in a negative light, the information is nevertheless of merit, especially when we use it to understand how the Armenian, in this case Manoog Dzeron, portrays the Other. The Other—the Turk and the Kurd—is never a separate subject of discussion in the remaining pages of the Parchanj book, nor in the work by Alevor. The aim of both authors is purely the re-establishment of Armenian memory and heritage. Other authors writing books in the memory genre in the post-genocide period also pursued this objective. They bear the stamp of the times, and follow the dictates of the spirit of the period. Here, the Other is overlooked and has no separate place in local memory. And if it is recalled, it is usually assigned a negative character, one of the causes of the tragedy Armenians experienced. But this, too, is just one face of reality. Thus, when we delve deeper into a study of the books by Manoog Dzeron and Alevor, it isn’t difficult to make out that the Other is implicitly present and is an integral part of the Armenian social fabric. The Other not only symbolizes violence and the final Catastrophe; the centuries-old coexistence between it and the Armenian also includes a number of grey zones. These appear unavoidably in simple descriptions, when the two authors write about daily life, farming, crafts, and commerce. Such short and specific bits of information are numerous and are the means to not only re-establish the daily life of Palu and Parchanj Armenians, but also to more closely study the existing socio-economic structure and the roles played by various groups operating there. The khorbologh (or khulinchak) described by Alevor would hang from the ceilings of village homes throughout Metz Pahk (Great Lent). Houshamadyan prepared the illustration based on Alevor's sketches. 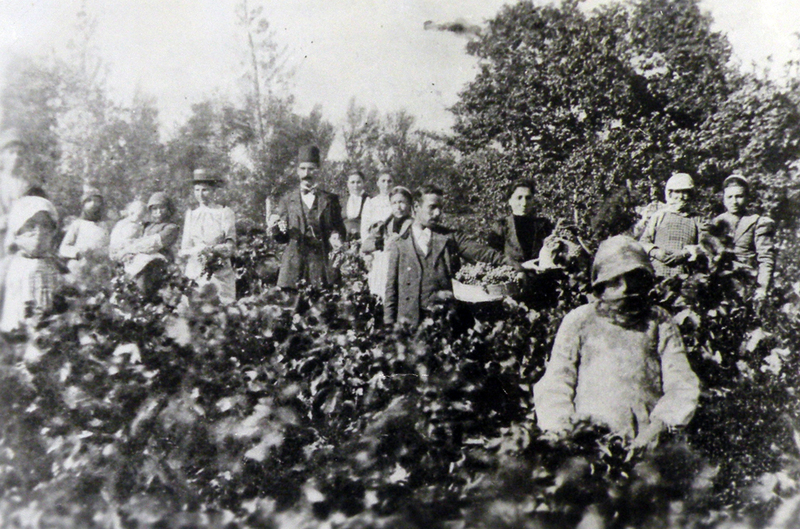 When describing the cultivation of wheat, cotton, and grape vines, Alevor speaks at length about the “one-tenth”  system (tithe) and its collection methods. These passages are very useful in gaining a better understanding of the various nuances in the tripartite Armenian villager–agha/bey–state relationship. Alevor also goes into great detail about how the tithe was collected. The tithe holder wouldn’t go to the villages himself, but would send his representative, a person called a shayna or shahna (likely the Turkish word şahne), to collect them. The person who carried out these functions was also known as a mültezim (contractor) or aşarci. In his book, Alevor records the entire ceremonial procedure—that is, how the shayna was received with great hospitality in the villages, how he would measure the wheat and other cereals taken to the threshing floor, how he would travel to the gardens and cotton fields to measure the amount of the overall harvest, how he would be bribed, and how disagreements would be settled. If the weakness of the state system and absence of governmental bodies could, on the one hand, open the door to a number of security issues, it could also, on the other hand, be the reason why Armenian villagers of Palu and Harput sought to independently organize communal life. The school system and its development is a case in point. Here, the arrival of Western missionaries spurred the establishment of modern schools in the Harput valley. The American missionaries operating in the Harput region opened the first modern educational centers. Education and the proselytization of Protestant or Catholic beliefs went hand in hand at these institutions. At the same time, however, the educational work carried out by the missionaries irrefutably imparted a new vibrancy in the provinces and created an atmosphere of competition that must, nevertheless, be regarded as positive and productive. The establishment of missionary schools, coupled with the adaptation of new teaching methods and the quick development of education for the girls in those institutions, surely created a powerful psychological and lifestyle shock to the rural milieu. Of course, the majority of Harput area Armenians, belonging to the Armenian Apostolic Church, would have preferred to have their own institutions. In terms of financial resources, the competition was on an unequal footing. Nevertheless, it is clear that community leaders couldn’t take a passive approach to this issue. The development of a dynamic and powerful missionary educational network truly became a call to arms and action directed at the Ottoman state and community (millet) bodies. Starting from the second half of the 19th century, state and community institutions began working to increase the number of government and community schools. But the example of the Harput region clearly shows the extent to which community structures, as compared to those of the government, were more dedicated to and proficient in the educational tasks they initiated. The quick growth and development of educational institutions belonging to the Armenian Apostolic community in the Harput valley, in the span of a few decades, was primarily the result of a spirit of organization, of inner communal cooperation and support. Manoog Dzeron was very familiar with the Turkish school established in Parchanj, especially since it was located quite close to his home. He also attended it for three days. Only boys could enroll in this institution, and there was no corresponding girls’ school. Dzeron’s description of the conditions at the school was quite negative. We do not know whether the school improved after Manoog Dzeron left Parchanj, but we do not believe it could have equaled the Armenian schools (Protestant and Apostolic) that had been placed on a solid footing beginning in the mid-19th century. In 1870, the Parchanj Apostolic community laid the foundation for the Krtasirats Society, which was tasked with supporting the boys’ school that had opened in 1845. In 1888, through the efforts of Krtasirats, the school moved to a new building and became co-ed. A Protestant school, with a standard curriculum, opened its doors in the same village in 1873. All of the students were Armenian. In the mid-1890’s, the Protestant school moved to a new building and also began accepting girl students. Parchanj residents who had immigrated to the United States contributed significantly to cover the financial costs of the Apostolic community school. In 1891, they established the Perchenj Gyughi Lusavortchakan Dbrotsasirats Enkerutyun (Perchenj Village Apostolic School Supporters Society) in the Massachusetts town of Fels. All of its members worked in the Boston Rubber Factory. Branches were quickly set up in towns throughout the United States—in Worcester, Whitinsville, Cambridge, Charlestown, Malden, Salem-Peabody, Stoneham, and Lawrence-Lowell, Mass. ; in Hartford, New Britain, Madison, Naugatucket, Conn.; and in the state of California. By 1902, these branches, combined, had a membership of about 100. During the 1912-1913 school year, the Parchanj boys’ school had six classes with 82 students, and the girls’ school had four classes with 32 students. This, then, is an example of communal cooperation, of villagers banding together totally independent of the state system. The educational life of Parchanj Armenians greatly benefited from such collaborative effort. Let us now take a look at the overall state of the Armenian diaspora when the books by Manoog Dzeron and Alevor were written. During the 1920’s and 1930’s, a politicized atmosphere reigned throughout the diaspora. Ideological conflicts had led to divisions within the larger Armenian communities of the United States, Egypt, Syria, Lebanon, Greece, Argentina, and France. The main reason for the intra-communal splits was the issue of Soviet Armenia, as well as the classic inter-party struggles and their effects on diasporan community structures. These were also years when Armenian compatriotic unions still played an influential role in Armenian political and cultural life. These societies also played their part in inter-community struggles. When we present the issue schematically, we see the ARF and the organizations supporting it on one side of the dividing line, and the Hentchak and Ramkavar parties, along with the AGBU, on the other. The first group assumed an uncompromising stance against the Communist regime in Armenia and fought for the restoration of the First Republic. The second group attempted to overlook its ideological differences with the Communists and viewed cooperation with the Soviet authorities as of primary importance, in the name of the development and strengthening of Armenia. The elements comprising the Armenian diaspora were mostly of an exile background. The partisan-ideological environment of intolerance and incompatibility sometimes led to violence and even death. In such tense conditions, divisions surfaced within various compatriotic unions, to the extent that two compatriotic unions, representing the same historic town or village, operated in opposition to one another in the same diasporan community. It was during this period when the first houshamadyan books appeared. It was not a rare occurrence for the partisan-ideological struggle to lead to more than one work being written regarding a former Armenian village, town, or region of the Ottoman Empire. Given the political atmosphere of the day, these books were regarded as opposing one another. One can rightly ask how it is possible to observe internal Armenian contradictions in books written about the memories of one Ottoman town or village. Interestingly, such divisions generally surfaced in a section that appeared in almost all of the memory works—that dealing with “political life,” “the political parties,” or “revolutionary/fedayi activities.” As dictated by conditions dominant in the diaspora, the authors of other such memoirs perhaps overvalued the importance of these chapters and devoted copious pages to them. Of course, the influence of post-genocide Armenian historiography had a role in this, as attempt were made to henceforth portray the centuries-old history of Ottoman-Armenians solely through images of violence, massacre, and resistance to despotism. The organizers of this resistance were the same political parties that continued to operate in the diaspora. Thus, if the author of a certain memoir didn’t portray a certain party “properly” in the aforementioned chapters, the aggravated party would launch the publication of an “accurate” accounting, which depicted it in a more fitting manner. It is certainly due to these contradictions that various locales (Harput town, Husenig, Bardizag (Partizak), Van, Musa Ler, Tomarza, Havav, Zeytun, Taron region, and others) have two or more memory books. For many years, Alevor served in the important capacity of locums tenens of the Armenian Apostolic Church in Egypt, where an Armenian community was experiencing the upheavals of political conflicts. He died during such a period of upheaval caused by the immigration movement to Soviet Armenia. Thousands of Armenians were preparing to relocate to Armenia, and the immigration assumed political overtones. Egyptian-Armenian newspapers were extensively and continually covering the issue. Against this backdrop, Alevor was quietly buried in Cairo. His funeral wasn’t even covered by the Armenian press. Despite these ideological and political interests, the works of the two authors remained loyal to their principle of portraying village life and free, for the most part, of the influence of post-Catastrophe reconstructed historiography of the period. It is this aspect that makes the books by Manoog Dzeron and Alevor, works that do not differ substantially from the memory books left by others of their generation in the magnificent genre of legacy writing, even more unique. All of them are creations from the same sense of urgency—to remember, recollect, and eternalize the Armenian life of the village or town. It was a life that members of that generation were forcibly torn from. They carried that longing for the lost homeland with them as they established their new lives on foreign shores. Marianne Hirsch, The Generation of Postmemory: Writing and Visual Culture After the Holocaust (New York: Columbia University Press, 2012); Marianne Hirsch, Family Frames: Photography, Narrative, and Postmemory (Harvard University Press, 1997). Rev. Harutyun Sargisian (Alevor), Բալու. իր սովորոյթները, կրթական ու իմացական վիճակը եւ բարբառը [Palu. Ir sovoruytnere, krtakan ou imatsakan vichake yev barbare] [Palu. Its customs, educational and intellectual state, and dialect] (Cairo: Sahag-Mesrob, 1932) p. 18. Manoog B. Dzeron, Բարջանճ գիւղ. համայնապատում (1600-1937) [Parchanj gyughe. Hamaynapatum (1600-1937)] [Parchanj village. Encyclopedia (1600-1937)] (Boston, 1938) p. 251. 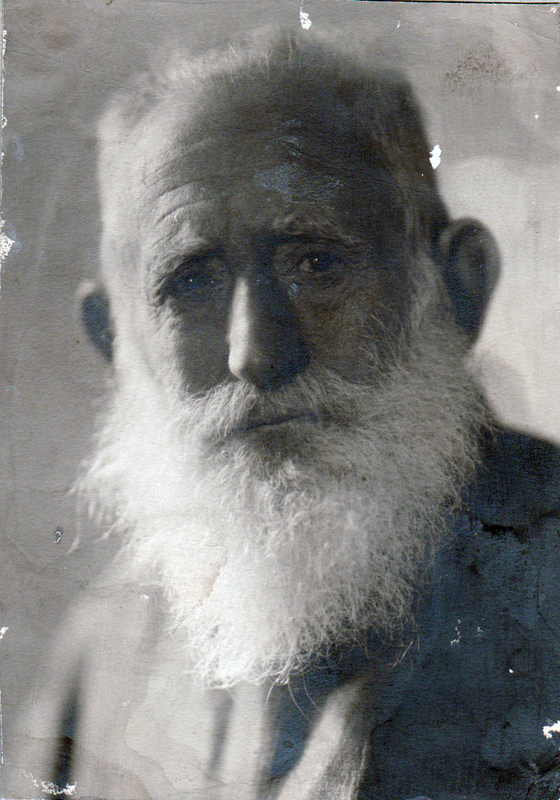 Born 1853 in Trabzon/Trebizond. School principal in Mush, community leader, and political activist. Died in Izmir in 1901. Born 1862 in the Aygestan neighborhood of Van. School teacher, community leader, and political activist. Died in Paris in 1927. Ibid., p. 58. Archbishop Garegin Srvadztiants. Born 1840 in Van (Aygestan). Author of the books Grots-brots (1874), Hnots-norots (1874), Manana (1876), Toros Aghbar (1878-1879), Hamov-hotov (1884). Became Primate of the Trabzon Armenian Diocese in 1885. Died in Istanbul in 1892. Ardashes H. Kardashian, Նիւթեր Եգիպտոսի Հայոց Պատմութեան համար, [Nyuter Yegiptosi Hayots Patmutyan hamar] [Material for the History of Egypt Armenians] Vol. 1 (Cairo, 1943) pp. 210-211; Alevor, p. A., 272. Ibid., p. a. Elsewhere in the book, Alevor writes that he was in Beirut in 1933 (ibid., p. 333). Interview with Haig Sarkisian (Alevor’s grandson), February 9, 2013. Marianne Hirsch, The Generation of Postmemory, p. 38. Ibid., pp. 109, 141, 188-189, 232-234. Aşar is the main source of income for the Ottoman treasury. Levied on agricultural production. Selçuk Akşin Somel, The Modernization of Public Education in the Ottoman Empire, 1839-1908 (Leiden/Boston/Köln: Brill, 2001) pp. 42-43, 202-204; Benjamin C. Fortna, Imperial Classroom. Islam, the State, and Education in the Late Ottoman Empire (Oxford/New York: Oxford University Press, 2002) pp. 50-60. Manuk K. Jizmejian, Խարբերդ եւ իր զաւակները [Kharberd yev ir zavaknere] [Kharberd and its children] (Fresno, 1955) p. 667.